Amazon sure knows how to keep everyone off balance. While retailers are figuring out how to use automated chatbots to service customers, Amazon is pushing a new personal styling feature that relies on the human touch. 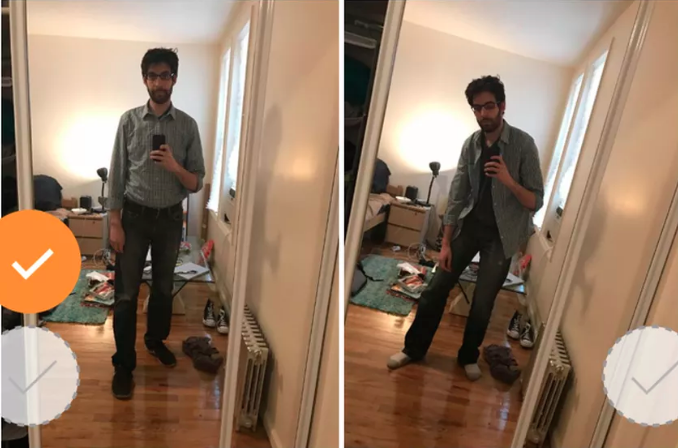 Amazon Prime customers may post two photos of themselves wearing different outfits of interest to them. And according to Amazon, your stylist is a real person, not a bot. Amazon says that Outfit Compare “is powered by a team of fashion specialists” whose backgrounds include retail, editorial, and styling. How Amazon corralled a team of fashionistas to help people in a stylistic funk is a weird question. It’s unclear whether there’s any sort of automation at play — because it’s hard to imagine a team of stylists eagerly waiting just to dress you. — Sam Blum, Thrillist. It’s not immediately clear how this feature will boost Amazon’s bottom line in the near-term. — Sarah Perez, TechCrunch. Amazon has added what might be the strangest feature for Prime members yet . . . Outfit Compare is a fun tool to mess around with, but it’s unclear what exactly Amazon gets out of it. — Chaim Gartenberg, The Verge. Those comments remind me of the bemused reactions when Amazon rolled out the Dash button in 2015. The Dash button seemed so out of the blue that many thought its launch was an April Fool’s joke. But two years later, Amazon says the list of brands signing up for the Dash program include Campbell’s Soup, Cascade, Clif Bar, Mentos, and Quilted Northern, to name but a few. All told, more than 200 Dash buttons exist. In other words, Amazon is not just messing around. So then what does Amazon get out of rating customers’ style habits? I think Amazon is using Outfit Compare to figure out how to create a more effective balance between human judgment and personalization through technology. Why? To become a true fashion brand. Amazon clearly wants to become a fashion brand. The company operates Amazon Fashion, which bills itself as “a one-stop destination for head-to-toe style.” Its moves to build up its fashion business also include, among other things, consulting with fashionistas such as Julie Gilhart (formerly the fashion director for Barneys New York) and hiring Caroline Palmer, formerly Vogue.com editor, as director of Editorial, Video, and Social Media for Amazon Fashion. Amazon has already launched seven private-label clothing brands, and Amazon is poised to become the largest clothing retailer in the United States. But selling a lot of clothing and being a fashion brand are two different things. Successful fashion brands build trust by possessing a sense of style and curating style appropriately. And as reported by Business Insider, Amazon gets lukewarm customer reviews for style curation. I suspect Amazon is watching Stitch Fix to learn about style curation. Stitch Fix is an online style recommendation service. The site uses artificial intelligence to analyze and recommend personal style options to its customers based on a variety of data, including information reported by customers. Personal stylists analyze the AI-based recommendations and then assemble a customized package of clothing, which is delivered to the customer. Customers can always return what they don’t want — in fact, returns help Stitch Fix’s AI engine get smarter. When a client fills out a profile and is ready to be styled, we are able to see what the algorithm is suggesting based on the data collected from her profile — everything from sizing to location, geography, body type, fabric preferences, colors and pattern preferences. It helps to not have to worry about the broad strokes of what a client does not want. Then we can make creative decisions about what will fit her body and her lifestyle. By contrast, without AI, a stylist might need weeks of working with a client to come up with the best recommendations. So far, the combination of AI and human judgment has made Stitch Fix so successful that more than 80 percent of its clients come back for a another delivery within 90 days, and one third spend more than half their clothing wallet share on Stitch Fix. Stitch Fix has achieved a valuation of $300 million since its founding in 2011 and is reportedly considering an IPO. Amazon is already known for using AI to power its product recommendations. But the launch of Outfit Compare suggests that to become a fashion brand, Amazon realizes it needs to apply more than algorithms. It looks to me that Amazon is learning from Stitch Fix to apply the human touch. Amazon is a fast learner. And what Amazon wants, Amazon usually gets. This entry was posted in Amazon and tagged AI, Amazon, Amazon Fashion, Amazon Outfit Compare, artificial intelligence, David Deal, fashion, Outfit Compare, Stitch Fix, Superhype. Bookmark the permalink.